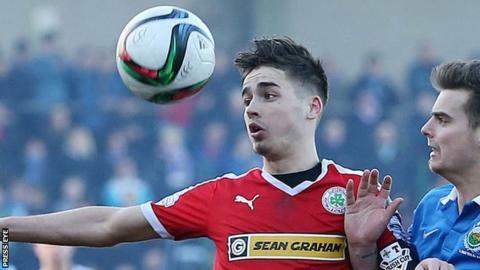 Cliftonville's two Irish Premiership Easter fixtures have been postponed due to international call-ups. Striker Jay Donnelly is part of the Northern Ireland Under-21 squad to face Scotland in Paisley on 29 March. Levi Ives and Andrew Mooney will travel to the Netherlands as the Under-19s play three games in the Uefa European Championship elite stage. The Reds' games away to Ballymena on Saturday and Carrick Rangers on Tuesday 29 March have been rearranged. Gerard Lyttle's side will face the Sky Blues on Saturday 2 April (15:00 BST), followed by their away trip to Carrick on Tuesday 5 April (19:45).